King Abdullah might be expected to help resolve the Palestinian problem in ways that could change his country’s character and demography, such as naturalizing refugees, forming a confederacy with the Palestinian Authority or becoming an alternative homeland for the Palestinian people. 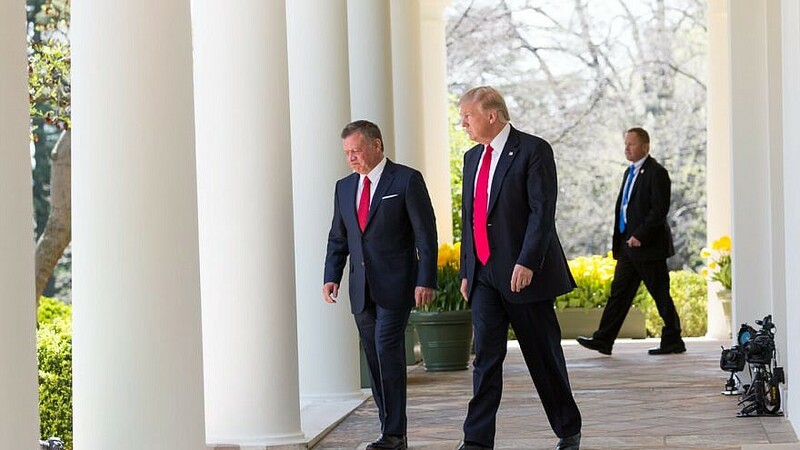 Jordan's King Abdullah (left) and U.S. President Donald Trump walk along the West Colonnade towards the podiums before a joint press briefing at the White House on April 5, 2017. Credit: White House/Shealah Craighead. (April 8, 2019 / MEMRI) In the recent months, U.S. presidential advisers Jared Kushner and Jason Greenblatt have increased their contacts with elements in the region towards finalizing the plan for Israeli-Palestinian peace known as the “deal of the century.” Jordanian King Abdullah II has made several visits to the United States lately, during which he was reportedly advised about the details of the plan and consulted on his country’s possible role in it. Ahead of the public announcement of the plan, expected to take place soon, there has been considerable apprehension about it in Jordan. This is due to leaks published in the Arab, Israeli and international media, according to which Jordan will be expected to take part in resolving the Palestinian problem in ways that could change its character and demography, such as naturalizing Palestinian refugees, forming a confederacy with the Palestinian Authority or becoming an alternative homeland for the Palestinian people. For example, the Lebanese Al-Akhbar daily reported on April 5 that as part of the deal, Jordan will be expected to naturalize about 1 million Palestinians in return for $45 billion. The daily speculated further that a confederation of Jordan, the Palestinian Authority and Israel’s Civil Administration in the West Bank is likely to be established; that all of Jerusalem will be annexed to Israel; and that the Israeli settlements will remain under Israeli rule. In addition, the Israeli media reported that the deal could include changing Jordan’s special status in Jerusalem by granting a role in the city to additional countries, such as Saudi Arabia and Morocco. This is another cause for concern in Jordan, which has led Jordanian officials to make hardline statements on the topic of Jerusalem in recent weeks. The concerns about the deal are also reflected in articles by senior Jordanian journalists, who have presented it as a “conspiracy,” an “existential threat” to the kingdom and as an attempt to eliminate the Palestinian problem at Jordan’s expense. King Abdullah himself made firm statements on the issue, clarifying that he would by no means succumb to the pressures being exerted on him. This report reviews the position of the Jordanian regime on the “deal of the century‚: its concerns about it and its expressions of refusal to bend to U.S. pressure. Recent reports indicate that the Trump administration aims to announce the details of the Mideast peace plan shortly after Israel’s April 9 parliamentary elections. Kushner and Greenblatt have indeed been holding contacts with many regional elements, including with the United Arab Emirates, Oman, Bahrain, Qatar, Saudi Arabia and Turkey, in an attempt to market the deal. In recent months, Jordan’s King Abdullah made several trips to the United States. During a Nov. 13, 2018 visit, he met with Secretary of State Mike Pompeo; several weeks later the two met again in Amman, as part of Pompeo’s Middle East tour that also included Egypt and Saudi Arabia. The Jordanian media reported on the king’s meetings in very general terms, saying that they dealt with the topics of strategic cooperation between Jordan and the United States, regional developments and efforts to end to the Palestinian-Israeli conflict, though it is likely that details of the “deal of the century” were discussed as well. King Abdullah made another visit to Washington, D.C., on March 10, apparently to discuss the deal, although the Jordanian press again reported on the visit very laconically, making no mention at all of the Palestinian issue. Jordan’s official news agency Petra disclosed that the king had met with Pompeo, National Security Advisor John Bolton, acting Defense Secretary Patrick Shanahan and with members of Congress.